I’m quite getting to like eggplant. It used to be my one vegetable that if I never ate again, I wouldn’t miss it. But I would happily make and eat this recipe again! I’ve made it twice now, and it was recommended to me by a friend, so that’s got to be a good sign. I very very very rarely peel any of my vegetables, and I didn’t peel the eggplant for this one either. However, I think next time I make this, I might try peeling it just to see what the difference is like. Preheat your oven to 220c. Line a large oven tray with baking paper. Halve each eggplant crosswise then slice each half into 6-8 wedges (6 if the eggplant are on the small side, 8 if large.). Put the wedges into a large bowl and drizzle them with the 90 mL of olive oil. Use your hands to mix them together so the wedges are thoroughly coated in the oil. Tip them onto the prepared oven tray and spread them out in a single layer. Put the tray in the oven and roast the wedges for 30 minutes or until they’re deep golden, turning them halfway through the cooking time. Meanwhile, heat the remaining tablespoon of oil in a very large frying pan over low heat. Add the garlic and ginger to the pan, and cook them, stirring, for 30 seconds. Now mix in the spices, harissa, rice malt syrup, tomato pesto, lemon juice and salt then turn off the heat. 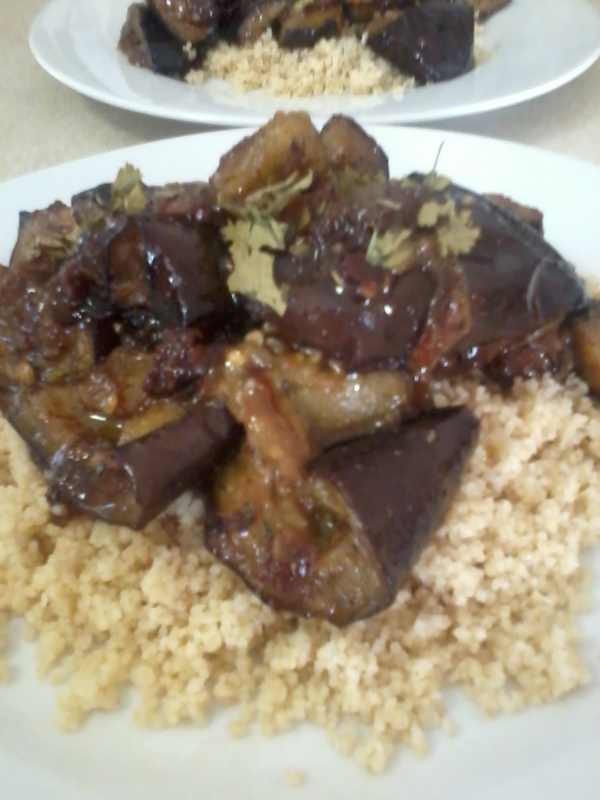 When the eggplant wedges are ready, re-heat the honey mixture over low heat. Using tongs, carefully transfer the wedges to the glaze mixture in a single layer. Cook them gently, turning them carefully once or twice, for 8 minutes or so until they have become impregnated with the glaze (just keep an eye on them as the glaze scorches easily). When the wedges are ready, turn off the heat and taste the glaze – add a little more lemon juice or salt it necessary. Using tongs once again, carefully pile the wedges into a shallow bowl or dish. Scrape any remaining glaze over the top. Sprinkle with tiny coriander or mint leaves and serve warm or at room temperature. I served this dish hot, over a bed of cous cous.